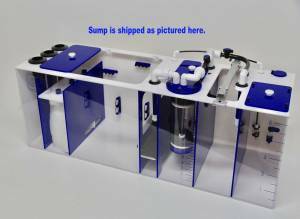 R Series Pro Plus sumps come with a built in refugium with 30 watt LED included and a 5 gallon ATO reservoir. This type of refugium is POST filtration which allows the micro organisms that multiply inside to be directly introduced into your aquarium without being filtered out. The ATO reservoir that is built into the sump body comes with a GEO Universal Float Holder so you can attach your own water level control sensors.